May 16, 2016 – Our time machine drops us off in December 1892, during the planning for Chicago’s Columbian Exposition — a forerunner of the 20th Century world’s fairs — with the perfect story for the boardwalks and carnivals of Summer 2016. 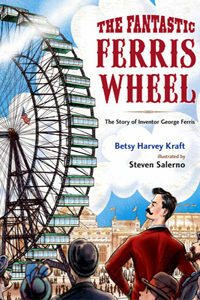 At the ticket booth is Betsy Harvey Kraft, and she’s sharing The Fantastic Ferris Wheel: The Story of Inventor George Ferris . You may have seen her several other nonfiction books for young readers, including Theodore Roosevelt: Champion of the American Spirit . The Fantastic Ferris Wheel is a book aimed at children ages 5 to 9, but it’s fun — as the saying goes — for children of all ages. And it’s beautifully illustrated by Steven Salerno. You can see some of the over 20 books he’s brought to life at StevenSalerno.com.